Was your shoulder hurt in an accident in West Virginia (WV)? Many people suffer from shoulder pain either immediately or shortly after a car wreck, motorcycle, or bike accident, slip and fall, or after having been hurt in a work accident. The severe trauma to the shoulder joint caused the impact of an accident can result in several different types shoulder injuries. The shoulder is a ball-and-socket joint with three main bones: the upper arm bone (humerus), collarbone and shoulder blade (scapula). These bones are held together by muscles, tendons, and ligaments. 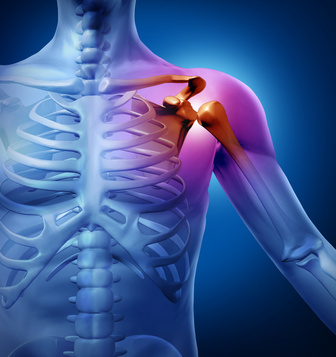 The shoulder joint has the greatest range of motion of any joint in the body. Because of this mobility, the shoulder is more likely to be injured, especially the acromioclavicular (AC) joint, which lays over the top of the shoulder. What you don’t know can hurt you. Click here to receive the information you need before signing away your rights to compensation: 7 Facts You Need to Know about WV Injury Claims. Rotator cuff tear: the most common shoulder injury after an accident is a stretching, tear, or rip in the tendons and ligaments in the shoulder joint. The shoulder has three separate joints, and any of these joints can be separated, causing extreme pain and loss of movement. What type of treatment will I need for a shoulder injury? Shoulder injuries can be accurately diagnosed by an orthopedic doctor through tests such as x-rays, CAT scans, MRIs, and clinical evaluation. The remedy may be as simple as the use of a sling to immobilize your arm and rest your shoulder to promote healing and reduce pain. A frozen shoulder usually begins when injury or overuse causes pain that, in turn, limits the shoulder’s range of motion. Common conditions that cause pain in the shoulder are bursitis or a tear in the rotator cuff. If you don’t move your shoulder much at all for many weeks, the tissue surrounding the shoulder joint thickens and shrinks. It loses its ability to stretch. When you try to move it even a little, it hurts. So to avoid the pain, you move the shoulder even less. As a result, the joint capsule stiffens even further. It’s a vicious cycle. A frozen shoulder can take months to develop. The cornerstone of treatment is physical therapy. At first, you’ll concentrate on exercises that stretch the joint capsule. Then you’ll move on to strengthening exercises. Full recovery can take several months or even longer. If you don’t improve steadily, go back to your doctor or consult a shoulder expert. In rare cases, a frozen shoulder that doesn’t respond to the treatments I’ve discussed may require surgery. It wasn’t my fault — how am I going to pay for treatment? If a combination of home treatment and physical therapy does not help your shoulder injury, shoulder surgery may be required. Surgery is not only expensive, but will require recovery time away from your workplace, limitations on your daily activities, and time and money spent on physical therapy and doctor’s visits. If your shoulder has been injured due to someone else’s carelessness or negligence, please contact our office for a free consultation to determine the best course for obtaining the financial resources needed to pay for your treatment and lost wages. Submitted by the Robinette Legal Group, PLLC, West Virginia Workplace Injury/Wrongful Death Lawyers. Call us today: 304-216-6695 or 304-594-1800 for your free copy of Righting the Wrong: WV Serious Injury Guide or Collision Care: WV Auto Collision Injury Guide. These books will answer your questions concerning negotiations with the insurance companies. Visit our website or call today for more information: 1-304-594-1800 or after hours, 1-304-216-6695. Other than injury from trauma, can shoulder joints simply wear out from repetitive work or sports activities?